. Last edited 16:29 1 Feb 2019. Fed Chairman Jay Powell surprised the market (and us) this week when he emphasised that the next policy rate move could be either up or down, and simultaneously expressed an accommodative stance on ending balance sheet reduction sooner than had been previously communicated. This came just a little over a month after Powell stated that the Fed was still anticipating at least two more rate hikes. Short of cutting rates outright, we could not imagine a more dovish outcome, and in fact we expected it would take at least until March for the Fed to shift its stance. This was a massive shift in policy, an abrupt about face, and it is likely to have implications for risk assets. At a minimum, it will force a rethink for many traders, primarily on the dollar but by extension on equities, commodities and bonds. For most of 2018, risk assets were reacting to an expectation of a Fed that was hiking rates (to infinity and beyond) and tightening liquidity. That is no longer the case. This was a dramatic reversal for Powell, who for the past year has been singing the same song—that it’s not the Fed’s job to backstop or change policy to support the stock market, even as President Trump tried to bully him into easing monetary policy. And yet the perception is that this is exactly what the Fed did this past week. Most risk assets rallied on the news, and we would expect that to continue. While unambiguously bullish in the short term, Powell’s pivot does present a conundrum for the medium term. When Ben Bernanke, the former Fed Chairman, made the decision to expand the balance sheet, he was able to sell the idea by stressing that there would be no difficulty in unwinding the Fed balance sheet. The last six months seem to disprove that claim, and the question is whether or not the Fed is now trapped. Powell has all but conceded that the size of the balance sheet is certainly going to remain higher than when the Fed started easing, but he has also conceded that it is likely going to be larger than even the Fed recently believed. The Fed has clearly been trying to stockpile enough ammunition to use for the next crisis, but it was unable to do so without a market capitulation. There is also no doubt that Powell’s credibility took a hit and now the market knows what his pressure points are. In the medium term, this is not a positive, as it leaves the Fed with a credibility gap to overcome with the market. But in the short term, this was a radical dovish pivot towards a much more accommodative position than the Fed had been advertising. 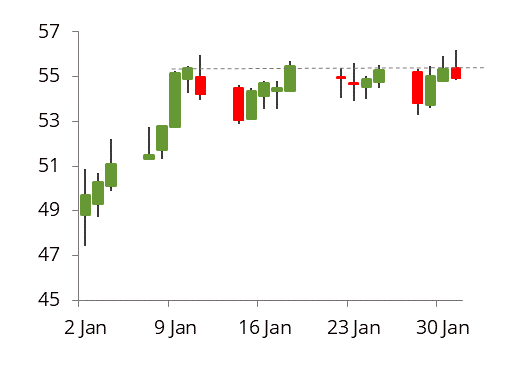 By Thursday morning, the futures market had effectively priced out any hint of a rate increase over the course of 2019, and the market is now starting to increase the odds of a cut. 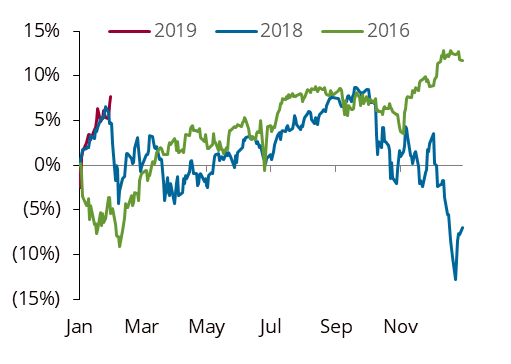 It was, in fact, the perception of a pivot that caused the selling to stop in December 2018 and led to the impressive January rally. If the market truly embraces the view that the Fed is trying to reflate asset bubbles, then risk assets will fly. At the end of the day, Powell’s choices are to reflate asset bubbles or keep hiking until he pushes the global economy into a deflationary death spiral. When presented this way, the choice seems less extreme. But the most obvious victim of renewed Fed dovishness, especially related to any reversal of quantitative tightening (QT), is the dollar. Bulls believe that the Fed has had a profound impact on currency markets since it started tinkering with the balance sheet. For the Fed, the verdict is still out on just exactly what sort of impact running down the balance sheet is having on liquidity and by extension volatility. Powell went out of his way to say that Fed funds was still the primary policy tool.And in the past, the Fed has not linked the balance sheet with policy signalling. But Powell did say that the Fed would be willing to look at the balance sheet as a function of financial conditions and the economy. He explicitly said that if proof emerges that running down the balance sheet was having a negative impact on liquidity, the Fed would be open to changing policy. Powell’s comment on Wednesday underlined that the Fed was exploring its options by talking about balance-sheet normalisation and a willingness to adapt should it need more time to study the effects of the balance-sheet run-off. Moreover, he added that the balance sheet could be “an active tool” in the future if warranted—which some have interpreted to mean more bond purchases if markets or the economy come under extreme pressure. What should be abundantly clear, is that Powell probably does have a ‘whatever it takes’ moment in him and won’t hesitate to use it when needed. Despite plummeting poll numbers, President Trump must be feeling pretty good about himself in a perverse kind of way. Despite the debacle that was the government shutdown, the reality is that the Tweeter in Chief is actually getting a lot of things that are very important to him, even if he is still getting blocked on funding for the Wall. He wanted oil prices lower even though he slapped sanctions on a major oil exporter, Iran, which he got—this doubtless helped give him the confidence to follow through on repeated threats to sanction Venezuela’s oil sector as well. He also wanted the Fed to stop hiking rates, and he looks to have gotten that. The final thing that he really, really wants is a weaker dollar. If the Fed starts tinkering with the balance sheet, and begins to roll back QT, he just might get that as well. And if he gets that, it is his pathway to his ultimate goal which is a higher stock market. We would not underestimate the importance of the Fed pause for the global macro backdrop. It's important to remember that while Fed Fund rates are at roughly 2.5%, the rest of the world remains at or close to zero. This is going to give some cover to other central banks (we are looking at you PBOC). Given the toxic politics surrounding the Trump administration, which is engaged in multiple trade battles, among other things, it isn’t clear if a coordinated global response is even an option the next time central banks have to deal with something more nefarious than an equity meltdown. Thus, we would carefully watch other central banks, as most tend to take their cue from the Fed, even if in this environment they can’t say so publicly. The world’s central bankers have been in policy normalisation mode for the past couple of years. But several central banks this week chose to leave rates unchanged, while the European Central Bank downgraded its assessment of the European economy, opening the door to new stimulus including a promise to keep interest rates where they are for longer. Moreover, ECB President Mario Draghi said restarting the giant bond-purchase programme that ended in December was an option “if things go very wrong”, though he also said that isn’t his forecast. It’s quite possible that 2019 will end up being a repeat of 2016, when the Fed, after signalling its intent to hike interest rates in 2015, spent most of the following year on the sidelines while it monitored a market correction triggered by worries of a sharp slowdown in China. This eased global liquidity, took pressure off currency pairs, and allowed others to mobilise stimulus. It could very well be that this is also Jay Powell’s intention since he is, after all, channelling his inner Yellen. Brent: Crude has rallied impressively, with the 18% gain over the first month of the year the largest January price appreciation on record. Even spreads have managed to erode the contango and are threatening to flip into backwardation. It bears repeating that, much like last year, this was meant to be the weakest period of the year, with refiners going into maintenance. Yet, just like last year, OPEC cuts, led by Saudi Arabia, are managing to limit the Q1 19 stock build, and the signals out of Saudi Arabia continue to suggest the Saudis are erring on the side of caution, especially given the massive miscalculation they made in 2018, when they pre-empted the loss of Iran barrels by surging production. 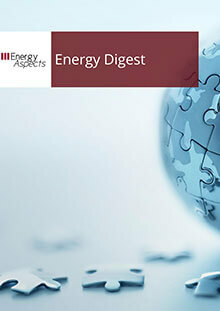 Now with the imposition of sanctions by the US on Venezuela, there is even greater risk to oil supply. The Trump administration has taken a big gamble that it will be able to resolve the Venezuela crisis in a matter of weeks. If it doesn’t, the risk to production will rise given the ban on sales of US diluent that is needed to produce heavy Venezuelan production, and a de facto deadline for service companies to cease working with the maduro regime by mid-summer. The longer this crisis drags, the greater the risk to Venezuelan production. To some extent we are already starting to see the impact. Dubai vs Dated Brent inverted this week, something we have been expecting for some time, and there is also a scramble for sour barrels in Asia. Oman is traded at a near $1 premium to Dubai and is also now pricing at a premium to Brent. The market continues to underestimate the impact of the Venezuela sanctions which is exacerbating a serious crude quality issue. WTI: Expectations for a build in January at Cushing have not materialised, and in fact month-to-date inventories are registering a 1 mb draw. An earlier-than-expected start-up of the EPD pipeline is helping alleviate bottlenecks in Permian and Cushing. WTI timespreads have bounced off their lows, even if the very prompt part of the WTI curve has lagged. The Dec-19–Dec-20 spread has rallied by $3 while Jun-19–Dec-19 has rallied by $1 so far this year. The whole curve has tightened modestly. 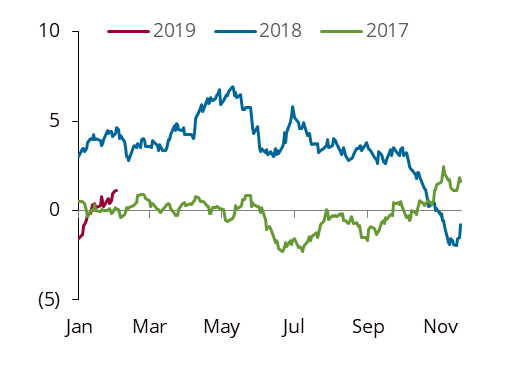 And if producers continue to hedge their 2019 and then potentially 2020 production, this should help prompt spreads relative to longer-dated crude. Indeed, Dec-19 WTI has struggled to rally above $55 in the last 10 days, a level that is apparently triggering a bit of hedging on the part of producers. Meanwhile, WTI has been outperforming Brent in the year to date and June WTI-Brent has narrowed to -$6.35 per barrel and December has rallied to -$5.72 per barrel. 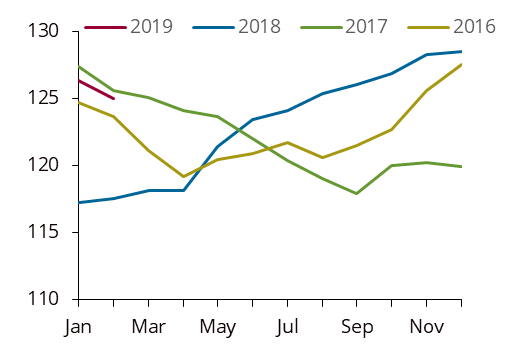 As US Permian pipelines fully connect, we would expect to see these trends continue, although refinery outages in PADD 2 will certainly act as a headwind in the very near term. But once refiners come back, and the pipelines are fully operational, we would expect to see WTI fundamentals continue to tighten. Though crude has rallied impressively in January, we continue to believe that the market is under appreciating upside risks from Venezuela, and now the risk boost from the Fed.